I was watching TV last night and i saw the advert for the video game “Gears Of War 3″ and i was wondering what is that music being used? Well it was a song by Mazzy Star called “Into Dust”. When trying to find this out i ended up finding more great musid from the Video Games series called Gears Of War. See below some of the games trailers and the music the goes with them. Gears of War 3 is a third-person shooter video game developed by Epic Games and published by Microsoft Studios exclusively for the Xbox 360. Originally due for release in April 2011, the game was delayed and eventually released on September 20, 2011. 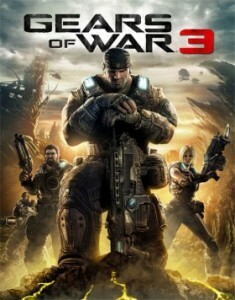 Gears of War 3 made over one million pre-orders and was one of the most anticipated games of 2011. It is the third installment of the Gears of War series, and the final game in the current story arc. Please note: some of the Gears Of War trailers contain content unsuitable for kids and you may need to be logged into youtude to view them. Other Gears Of War trailers and their music.